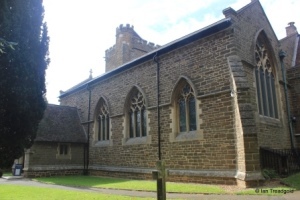 The church of St Mary the Virgin in Maulden is situated to the west of the village, north of the main road through Maulden. It graces a ridge above the village making it visible from many parts of the village. 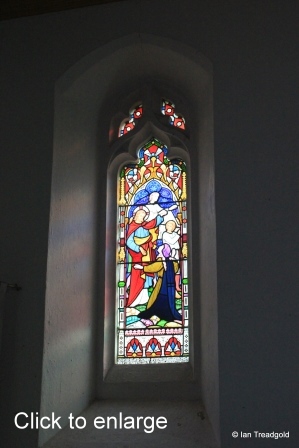 Equally, from the west end of the church there are views over Maulden and the surrounding area. Parking is available in the church car park off Church Road. 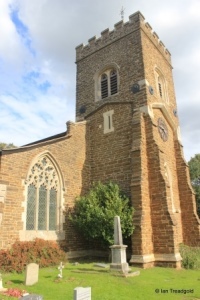 The origins of the church date back to C13 when there was an earlier building on the site owned by monks from Dunstable. After the dissolution, the manor of Maulden along with the church passed to Thomas Bruce, Earl of Elgin. 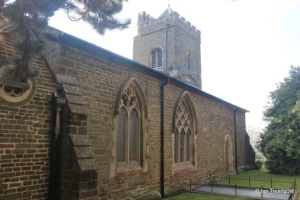 Whilst the manor was passed to the Duke of Bedford, the church remained in the patronage of the Ailesbury family until 1954. 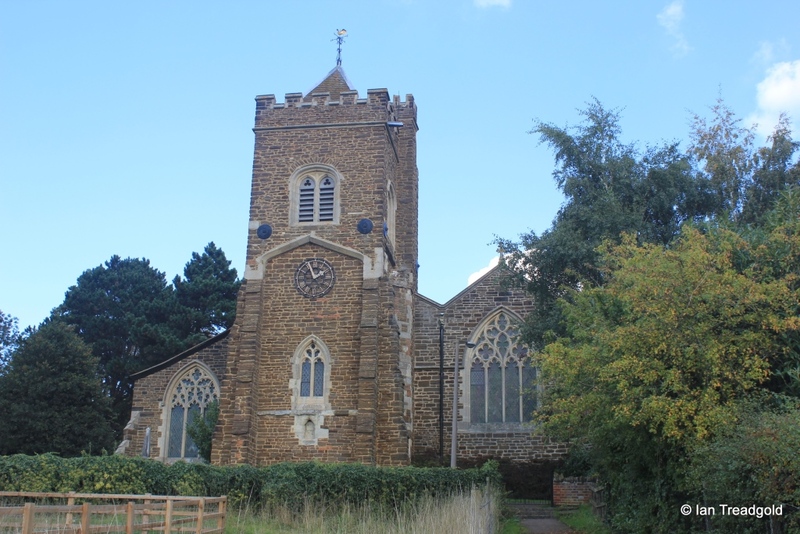 In the early C19, the church consisted of a tower, low roofed nave, chancel and north aisle and was becoming unsuitable for the growing village and surrounding area. Plans were put in place to undertake extensive alterations the end result of which, in 1859 was a rebuilt church with nave, chance, north and south aisles, tower and south porch. 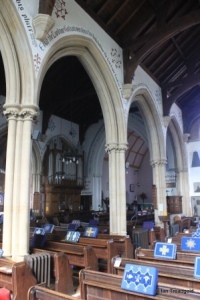 The chancel is around 26 feet long with the nave adding a further 54 feet with both being 24 feet wide. 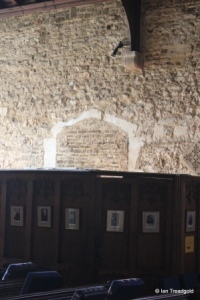 The south aisle is around 16 feet wide with the north being 13 feet. The tower is around 10 feet square and 48 feet high. 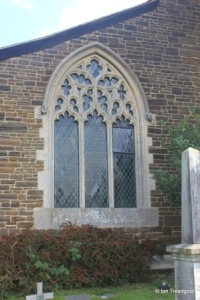 The south aisle was added in the C19 alterations and has a east and west windows and three windows on the south side, all to the east of the porch. Unusually, the nave has no clerestory resulting in the aisle having a complete roof to itself rather than being subordinate to the nave. 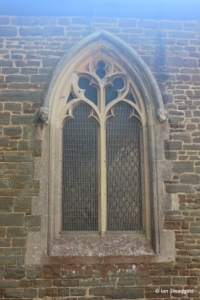 The east window of the south aisle is of four lights with tracery in the geometric style above. 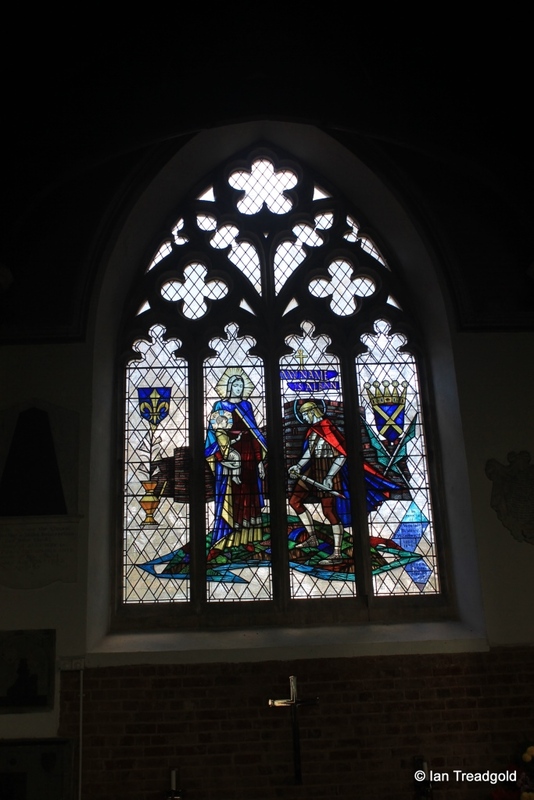 The chapel at the east end of the aisle is known as the St Alban Chapel and the glass in the window depicts the saint giving his sword to Jesus to show his allegiance. St Alban was a Roman soldier executed for his faith and is shown wearing his soldiers uniform. 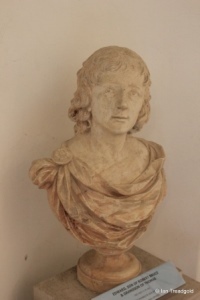 It was given in 1984 in memory of Veronica Woodward by her parents. 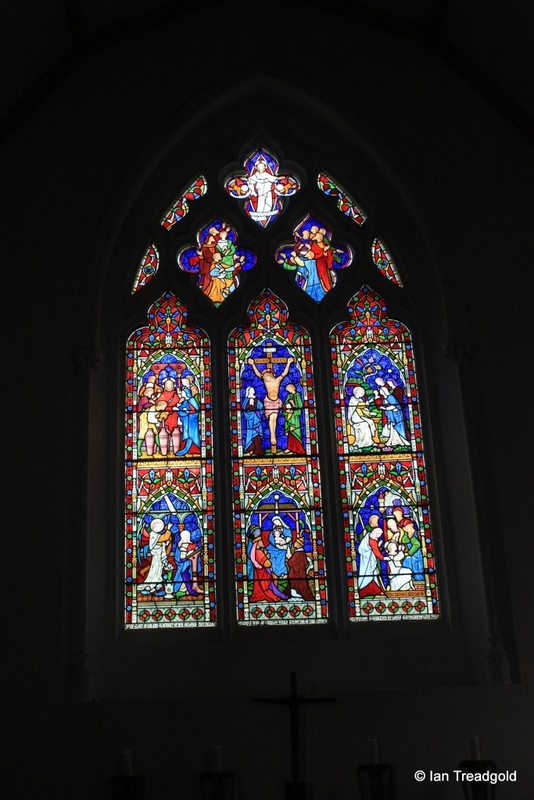 The three south facing windows are of two lights for the eastern window and three lights for the others. All are cinquefoiled but with differing tracery above. 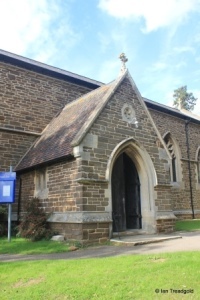 The tiled south porch was added at the same time as the aisle and has small two light windows to east and west. 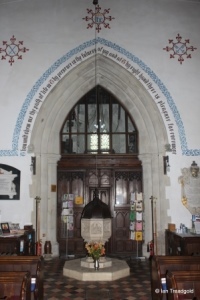 The doorway itself shows some of the Sgraffito decoration that is a feature of the church. 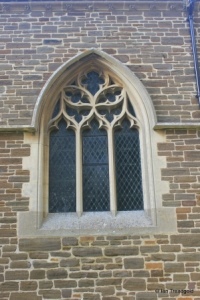 The west window of the south aisle is of four cinquefoiled lights with geometric tracery above under a two-centred arch. 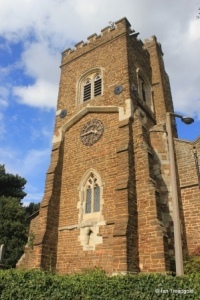 The tower is unusual in that whilst the lower portion dates from the original pre C19 work being C14, the upper level is wider and supported on arches and the angle buttresses of the original tower. 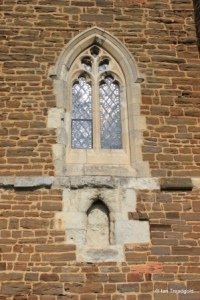 There is an internal stair turret in the south-east corner of the tower. The roof of the tower is embattled and there is a pyramid roof on the top. 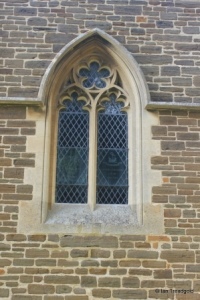 There is a small west window of two trefoiled lights with under a pointed arch with a clock face above facing the village. There is a small statue niche below the window. 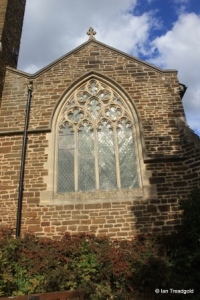 The north aisle has a west window, two north facing windows, a blocked north doorway and ends with the vestry against the north side of the chancel. 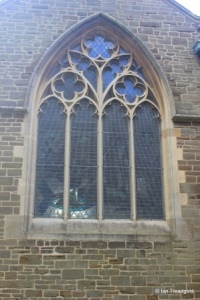 The west window is of three cinquefoiled lights with ornate tracery above under a two-centred arch. The roof line above shows the north aisle directly linked to the nave in contrast with the south aisle. 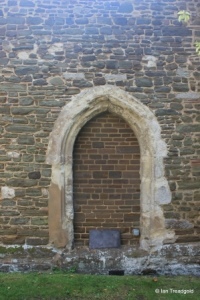 The north doorway dates from before the C19 rebuilding work but was blocked, presumably during that work. It is still visible in the rough brick work inside the north aisle. 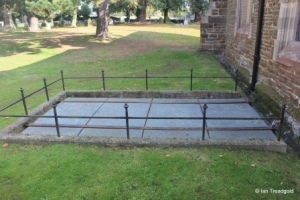 Prior to the C19 work the Ailesbury Mausoleum was connected directly to the church but that passageway was removed and windows inserted in the north aisle. 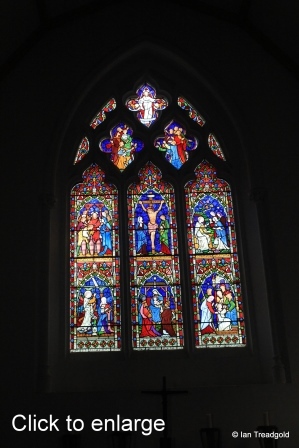 The two windows on the north side of the aisle are of markedly different styles. 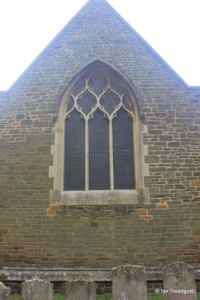 The western is quite wide with three cinquefoiled lights with regular tracery patterns above. The eastern is much plainer with just two trefoiled lights. 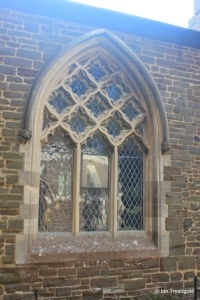 The east window of the chancel is of three trefoiled lights with geometric tracery above under a two centred arch. 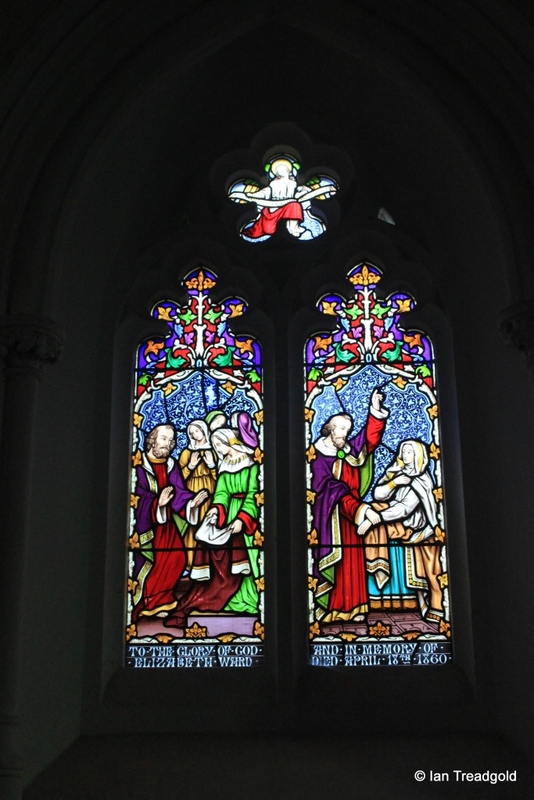 The glass in the window depicts scenes in the life of St Mary; the miracle of water into wine, the Crucifixion, the Annunciation, the Resurrection, the Nativity and the presentation of Jesus in the Temple. The glass was given in memory of Charles Ward who was rector from 1825 to 1879 and who oversaw the rebuilding works. 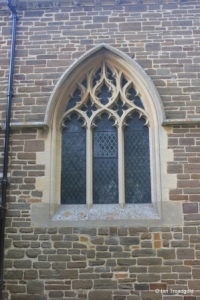 The two other windows on the south side of the chancel have glass also dating from this period with the two-light window in memory of Elizabeth Ward, wife of Charles Ward. 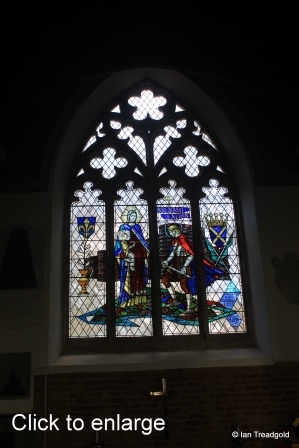 The single light window is in memory of Lt Foster Melliar who died at the siege of Lucknow in India in 1859. Inside the church, the most striking feature is the use of the Sgraffito to decorate the walls. 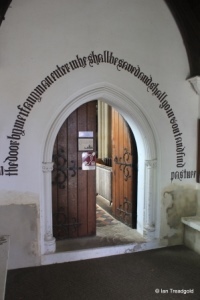 It is produced by incising designs and in the case of Maulden, scripture texts into wet plaster using layers of plaster containing different coloured pigments. Dating from the rebuilding works in C19, the Sgraffito was restored in 1997. 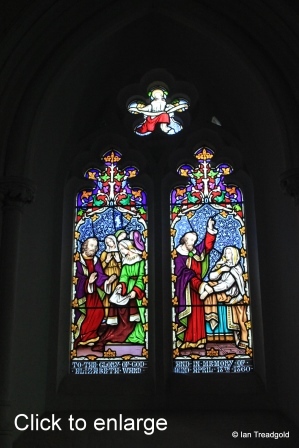 The font is Victorian, dating from the C19 rebuilding works and shows biblical scenes in relief. 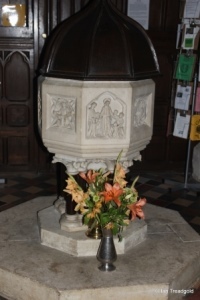 The original C12 font was donated to the new church of St Hugh in Lewsey, Luton. 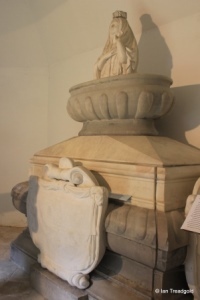 The Ailesbury Mausoleum to the north of the church was originally built by Thomas, Earl of Elgin in 1656. 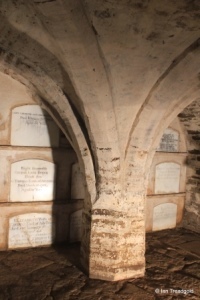 Whilst the original building dated from this time, the crypt underneath was used for burials prior to this. 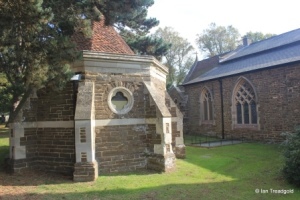 The octagonal building was originally connected directly to the church as has already been mentioned but it was separated during the C19 works. The Mausoleum was also rebuilt at this time. 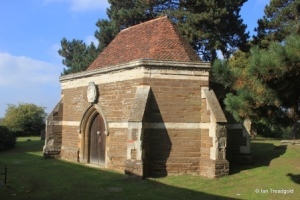 The Mausoleum is now owned by Bedfordshire County Council and is managed by the Council in partnership with the Maulden Parochial Church Council and Maulden History Society. 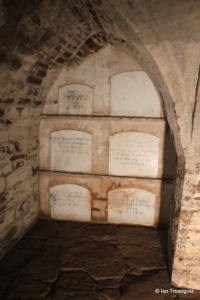 Access to the Mausoleum is made available on certain dates through the year. 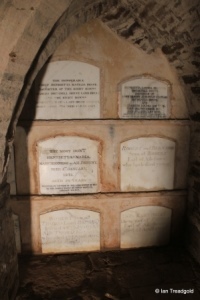 The crypt is accessed down a steep flight of stairs from just outside the north wall of the church. 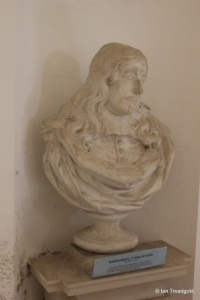 Inside the Mausoleum there are busts and statues depicting members of the Elgin family, whist in the crypt are the entombed remains of many of the family.